In: Fed Poly Nekede 2017/2018 Matriculation Ceremony Announced!!! Fed Poly Nekede 2017/2018 Matriculation Ceremony Announced!!! Federal Poly Nekede has announced the date for her 2017/2018 matriculation ceremony. All newly admitted students of the polytechnic as well as their sponsors are hereby informed. 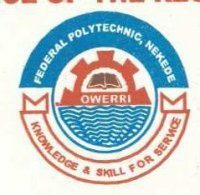 The management of the Federal Polytechnic Nekede, Owerri wish to inform all new students of the institution that have just been offered provisional admission into the school that they will be officially matriculated into the school. See full details concerning the date, venue and time below. The date of the ceremony is March 7th, 2018. The school also invite the general public and students(freshers) of federal polytechnic Nekede, owerri to the event. Date: Wednesday, March 7th, 2018.